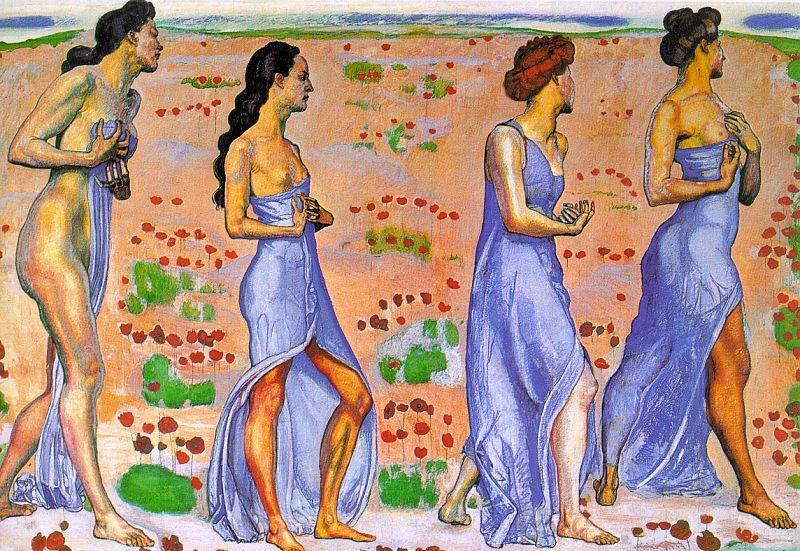 At the end of the nineteenth century Hodler was one of the leading Symbolist painters. 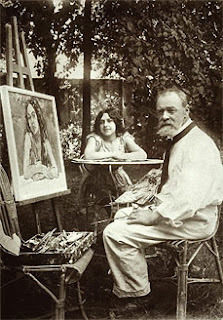 His creative force, his taste for decoration and his simplified painting are reminiscent of Rodin and Puvis de Chavannes, the undisputed masters with whom he is often compared. 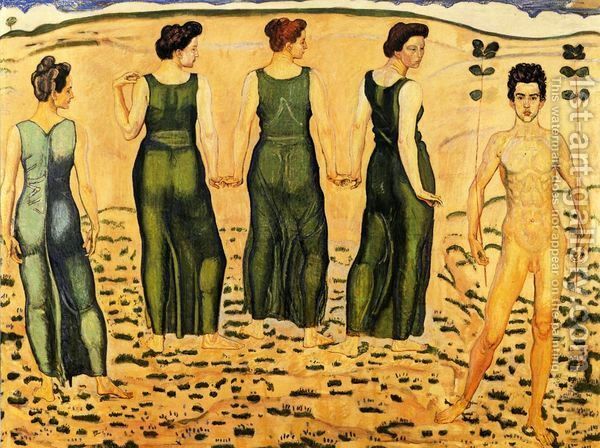 However, Hodler remains relatively unknown in France, whereas in Switzerland he is considered their great painter, and in Germany and Austria he is regarded as one of the founders of modern art. 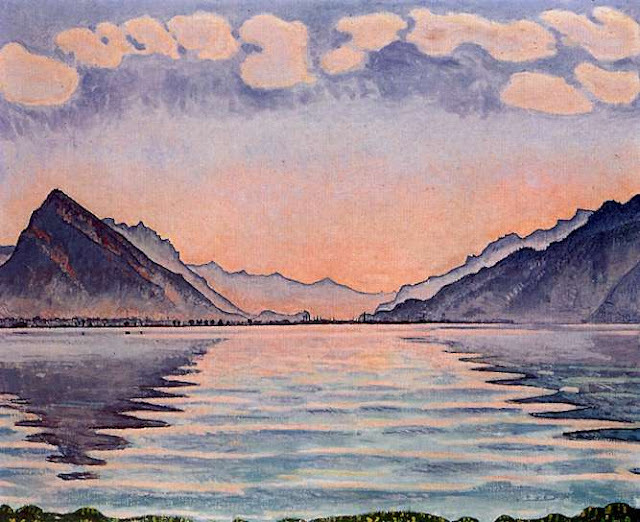 This post shows samplings of Hodler's works from 1890 on. 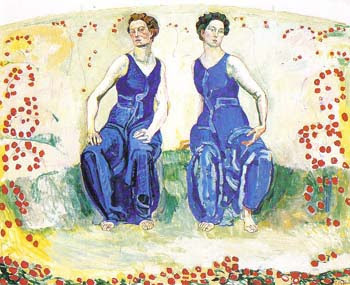 Hodler was 37 when he made this autobiographical painting on the theme of sleep and the fear of death, but also on the relationship between men and women. All the Michelangelo-like, shadowless figures appear to be naked and are draped in black sheets. 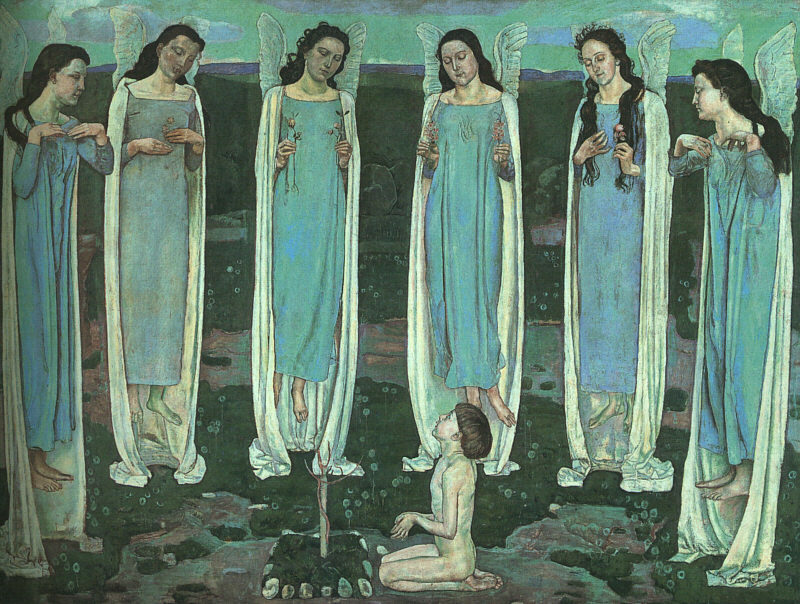 Both the central figure and the man top right are Hodler himself, while the female figure seen from the back on lower right is his wife at that time-Bertha Stucki (this is the only time she appeared in one of his paintings). The figures in the foreground sleep peacefully; those in the background less so. The contented couple bottom right can be contrasted with the man and two women top left who seem slightly less at ease (the middle figure of this group could be Bertha again). 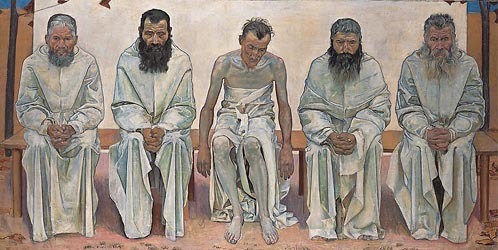 In the middle lies a terrified young man (Hodler) with the figure of death placed squarely between his legs. 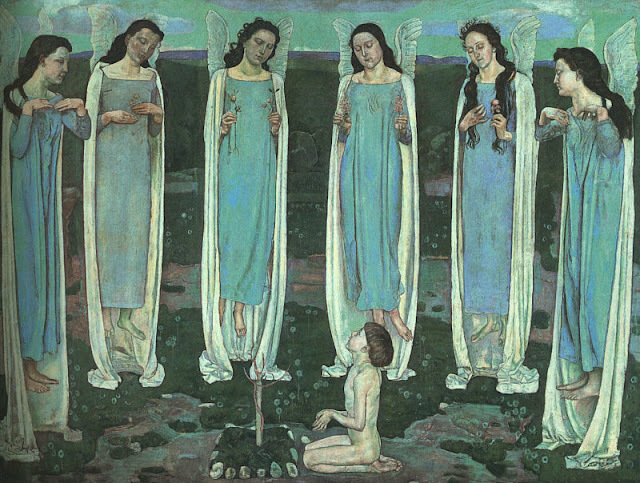 Hodler had good reason to be preoccupied with dying, having grown up amidst grinding poverty and having witnessed the slow death of all his family from tuberculosis. 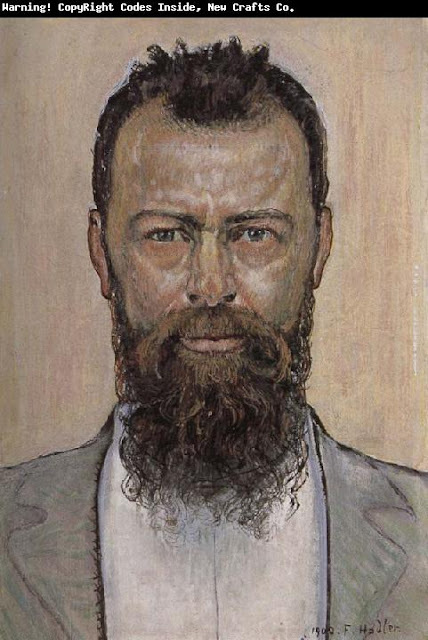 His father died when he was 7, his mother when he was 14, his stepfather when he was 17, and his four brothers and one sister-Hodler was the oldest in the family-all died between his eighth birthday and the time he was 32. Nor is it unusual that Hodler should put himself in the picture. In all, he painted 100 self-portraits-more than any other painter except Van Gogh himself. Read the rest at Diva International. very interesting; don't know this guy at all. love the repetition in some paintings. Please come to my Homepage for my H, hope to see you. This was so interesting to read. Especially the center picture of the fear of death. The details, and your explanation bring so much meaning to the painting, and the pain of death the artist felt. Thanks again for a deep look into an artist and his work. I learn so much from blogging! I'd never heard of Hodler. I prefer the water-scape, but all the figures are arresting and the portrait at the start is arresting. What eyes! I have never heard of this guy and what powerful paintings. Great post. I appreciate all your research. wow, I'm unfamiliar with this artist. he's one freaky dude. I love "the chosen one" and "Lake Thun". actually I like them all. great post Gina. Certainly very colourful my friend. Thanks once more for taking the time and having the patience to introduce us to yet another artist whose work I wasn't familiar with. His paintings aren't romanticized at all but are very thought provoking. It seems to me as if a Renaissance artist has stepped into the 19th century and must repeat what he sees in order to know that it is real. Does this make sense to you? At first I wondered why compare Hodler to Rodin, but once you see his work you can only call his figures sculptural. The artist has me respecting flesh again. Wow! Wonderful stuff. Thanks for this post. Hodler is awesome! What a tragic life he had, with all his close relatives dead in such short period of time... Thanks for sharing! Very interesting! He certainly has a style of his own. Thanks, as always, for showing me something new - and finding a good spread of paintings to represent the artist's work. Lately I am struggling with a drive towards more painterly style and more freedom in my own work, which perhaps leads to a recoil from the formality and thin-ness of these images and this style/school of painting. Sometimes my subjective position as a painter and struggling draughtsman makes a more objective view difficult. Steve - your comments could be substantial blog content in and of themselves! I'm going to have to start quoting your comments and including them in my blog posts! I wish we had time to co-blog. It would be fun! I like your description of what symbolism looks like to you. It's a great definition! What you say about symbolism not registering with you emotionally, I immediately thought this and so it is very visceral - the emotion for me in these Holdlers is the mysticism they evoke for me. I don't quite have a grasp on it intellectually, and even the emotion is buried or not quite ready to illustrate itself, or whatever. The Gift had those aspects to it, for me. Emotionally, spiritually and intellectually, Redon is not only my favorite symbolist but one of my favorite artis, ever. I think there is less in his work of the art nouveau piece that you addressed - that decorative style which reveals itself to me so much in Hodler's women in blue. Redon, I believe is more the "real deal", if you will. Thank you, as always, my friend for taking the time. And. For. Thinking. Much appreciated. Hi, Helen. I'm not sure. I wish Steve could answer that one! :-) I guess each generation of artists through history, influences another. Thank you so much for stopping by! Your comments reveal a genuine interest. I appreciate it very much. Everyone - obrigado, as we say in Portugal! (I'm getting ready to put my Portuguese hat on and go on over for a visit to your blog! Yogi - with comments like that, it makes it worth it! Thank you muchly. I read Helen's comment and quite agree with her thoughts on Rodin and the Renaissance - I can see both points. The figures are quite sculptural. I had noticed the repetition and arrangements and thought architecture, but it's even more sensible to be reminded of the Renaissance preocupation with balance and gemonetry, and the sculptural traditions of bas relief and friezes. That lets me see these in a new light. As did your comments about mysticism, Pagan, and about Redon. I also find Redon to be the most compelling of this movement, and one of my favorites, along with Klee and Hundertwasser, who also were painting in ways that seem to draw on the subconscious and inner sense and vision - as well as on organic forces. I see these better now. Thank you! This took me from "Hoo the Hell is Hodler" all the way to "Holy Cow!" I LOVE that about your art posts - Thank You!! CR - okay, so..now you can't spell? You're on quite the hick town kick! :-D razzin' ya! Nydia - I didn't see a link back to a blog for you. Thank you coming by! Your salutation reminds me of how my Portuguese cousins often finish off their correspondence to me - "beijinhos" :-) A warm welcome!